Phagocytosis. 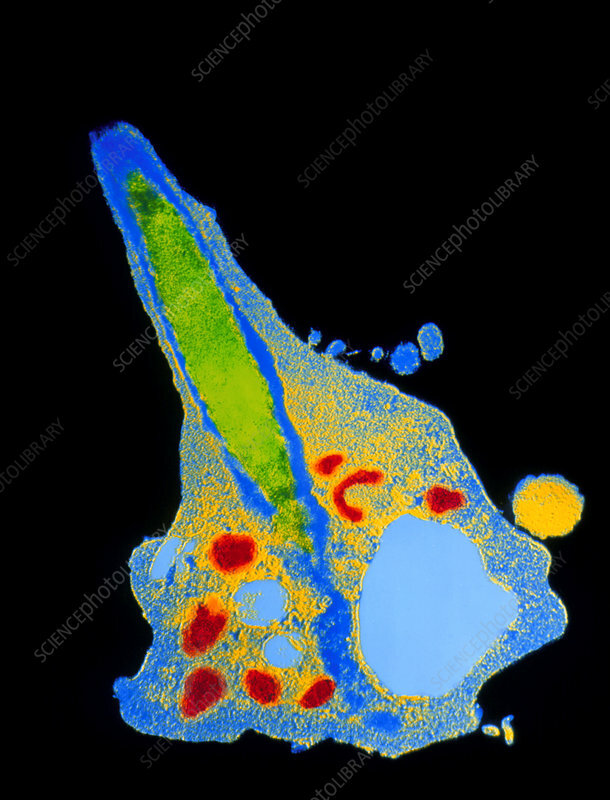 Coloured transmission electron micrograph (TEM) of a polymorphonuclear white blood cell ingesting a bacterium (Selenomonas sp.). The white blood cell is sectioned through, with rounded cell organelles seen at lower left and right. It has engulfed, by the process of phagocytosis, a long bacterium visible at top (green); another bacterium is seen in cross- section outside the cell at lower right (yellow). Through phagocytosis certain white blood cells and macrophages of the immune system are able to ingest and digest foreign particles such as bacteria that may cause harm to the body. Magnification x17,150 at 6x6cm size.